Last night I was in the process of writing a post on glorified tutus (check back next week), but while standing on a chilly NY sidewalk after my hotel was evacuated, I decided to change focus. I couldn't help style stalking a fellow displaced patron donning a chic and cozy looking cape. Right then I decided my life, or at least nights like this, would be infinitely better if I owned/was wearing a cape of my own. So, while waiting to get back into my room and sucking down sipping on a glass of $17 California wine (any price for a taste of home), I started doing a bit of online shopping #dangerzone. 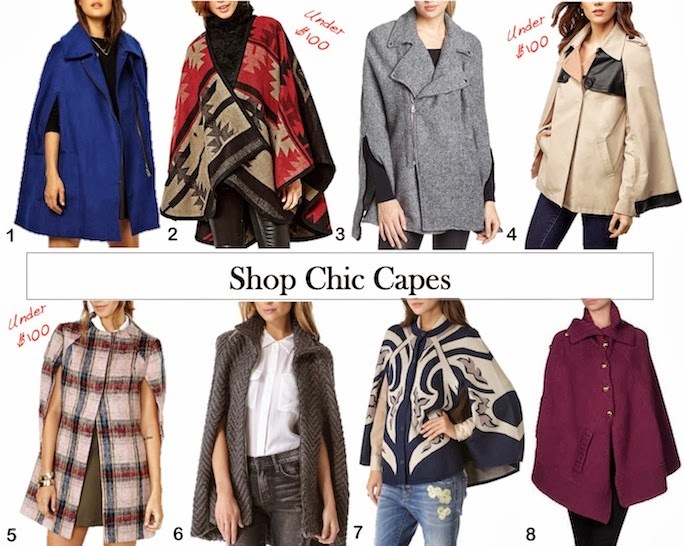 From winter white, to Parisian plaids to modified trench coats - capes are not only functional, they are pretty darn fabulous looking! What do you think, are you feeling me here on the cape crusade? I can't wait to read your post on tutus! Capes are fabulous. I bought one last year on sale at Target. It was from the Neiman Marcus + Target collection. I actually can't believe I've only worn it once. Shame on me! But thanks for reminding me about capes...I need to wear mine more often! I wore a cape last year, and it is so much fun, good luck finding the perfect one. I'm not a big fan of cape but I do have couple in my closet lolzz, oh I love the one from Nasty Gal, gotta get one. ooohhh...I want a cape too...so girly and flirty and elegant at the same time! I like 6 and 7 of course!! expensive ones.